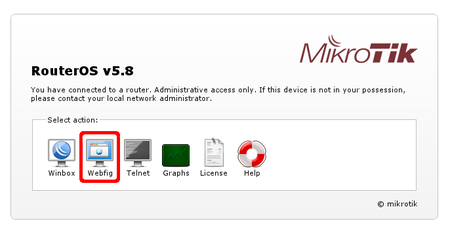 Congratulations, you have got hold of MikroTik router for your home network. This guide will help you to do initial configuration of the router to make your home network a safe place to be. The guide is mostly intended in case if default configuration did not get you to the internet right away, however some parts of the guide is still useful. Router's initial configuration should be suitable for most of the cases. Description of the configuration is on the back of the box and also described in the online manual. Connect LAN wires to the rest of the ports. 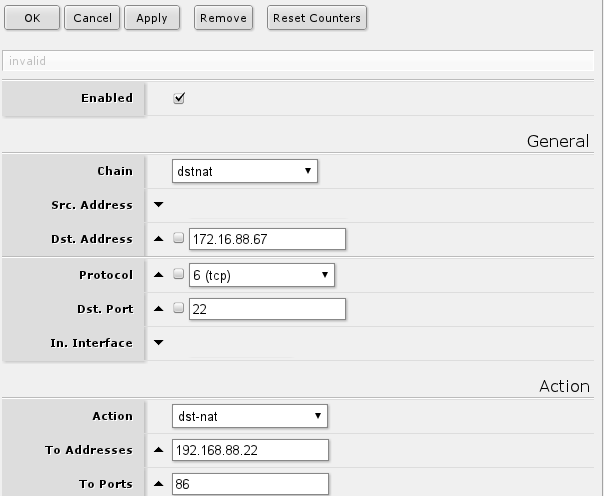 Initial configuration has DHCP client on WAN interface (ether1), rest of the ports are considered your local network with DHCP server configured for automatic address configuration on client devices. To connect to the router you have to set your computer to accept DHCP settings and plug in the ethernet cable in one of the LAN ports (please check routerboard.com for port numbering of the product you own, or check front panel of the router). To access the router enter address 192.168.88.1 in your browser. Main RouterOS page will be shown as in the screen shot below. Click on WebFig from the list. 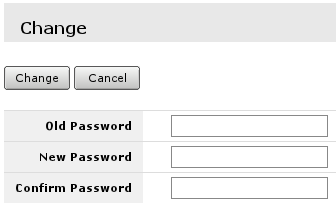 You will be prompted for login and password to access configuration interface. 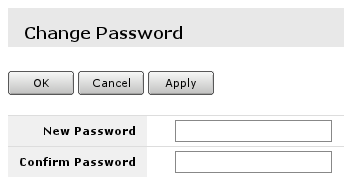 Default login name is admin and blank password (leave empty field as it is already). It is good idea to start with password setup or add new user so that router is not accessible by anyone on your network. User configuration is done form System -> Users menu. When you click on account name (in this case admin), edit screen for the user will be displayed. If you click on Add new button, new user creation screen will be displayed. Both screens are similar as illustrated in screenshot below. After editing user's data click OK (to accept changes) or Cancel. It will bring you back to initial screen of user management. In user edit/Add new screen you can alter existing user or create new. 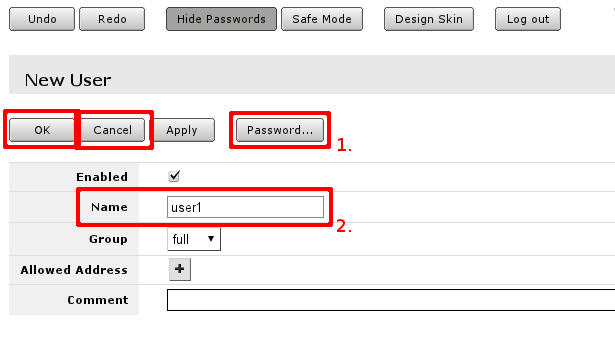 Field marked with 2. is the user name, field 1. will open password screen, where old password for the user can be changed or added new one (see screenshot below). 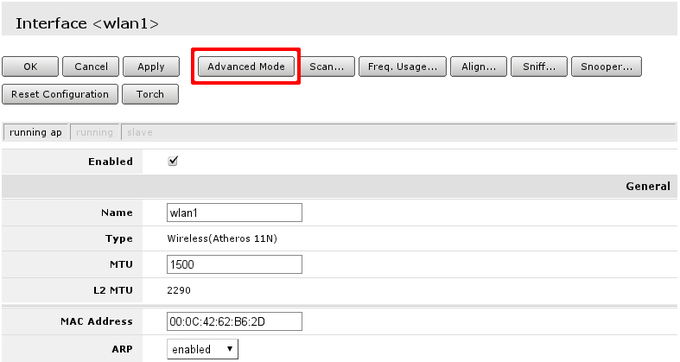 Default configuration is set up using DHCP-Client on interface facing your ISP or wide area network (WAN). It has to be disabled if your ISP is not providing this service in the network. Open 'IP -> DHCP Client' and inspect field 1. to see status of DHCP Client, if it is in state as displayed in screenshot, means your ISP is not providing you with automatic configuration and you can use button in selection 2. to remove DHCP-Client configured on the interface. You will have one address here - address of your local area network (LAN) 192.168.88.1 one you are connected to router. 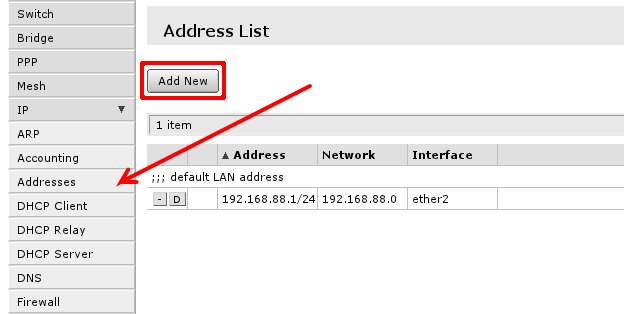 Select Add new to add new static IP address to your router's configuration. both of these notations mean the same, if your ISP gave you address in one notation, or in the other, use one provided and router will do the rest of calculation. Since you are using local and global networks, you have to set up network masquerade, so that your LAN is hidden behind IP address provided by your ISP. That should be so, since your ISP does not know what LAN addresses you are going to use and your LAN will not be routed from global network. 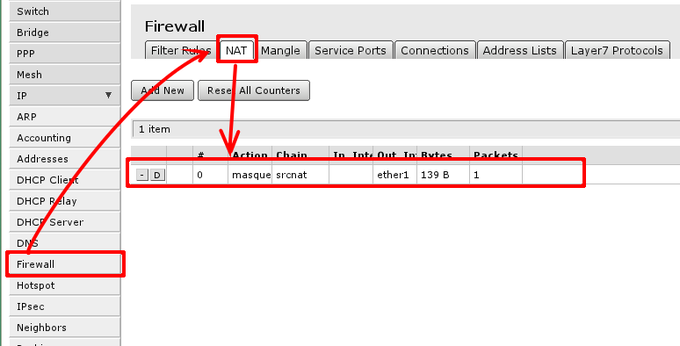 To check if you have the source NAT open 'IP -> Firewall -> tab NAT' and check if item highlighted (or similar) is in your configuration. action should be set to masquerade. 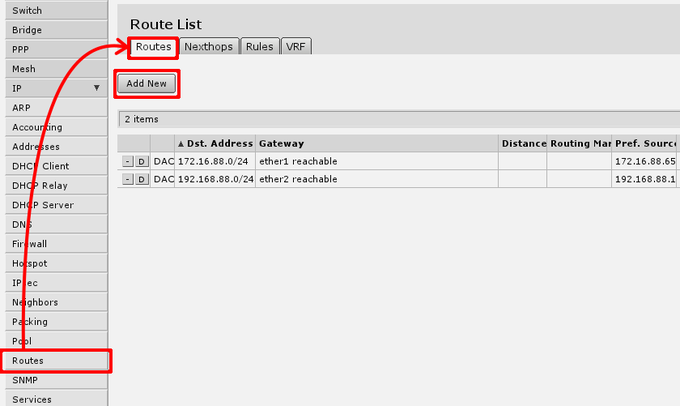 under 'IP -> Routes' menu you have to add routing rule called default route. And select Add new to add new route. here you will have to press button with + near red Gateway label and enter in the field default gateway, or simply gateway given by your ISP. This should look like this, when you have pressed the + button and enter gateway into the field displayed. After this, you can press OK button to finish creation of the default route. At this moment, you should be able to reach any globally available host on the Internet using IP address. To be able to open web pages or access Internet hosts by domain name DNS should be configured, either on your router or your computer. In scope of this guide, i will present only option of router configuration, so that DNS addresses are given out by DHCP-Server that you are already using. 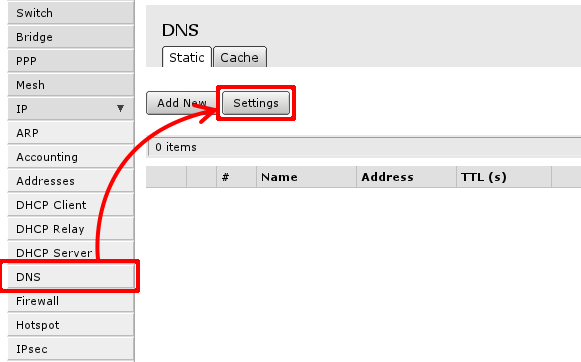 Then select Settings to set up DNS cacher on the router. You have to add field to enter DNS IP address, section 1. in image below. 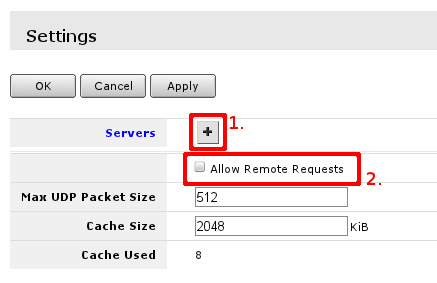 and check Allow Remote Requests marked with 2. Note: Filling acceptable value in the field will turn field label blue, other way it will be marked red. RouterBOARD routers do not keep time between restarts or power failuers. 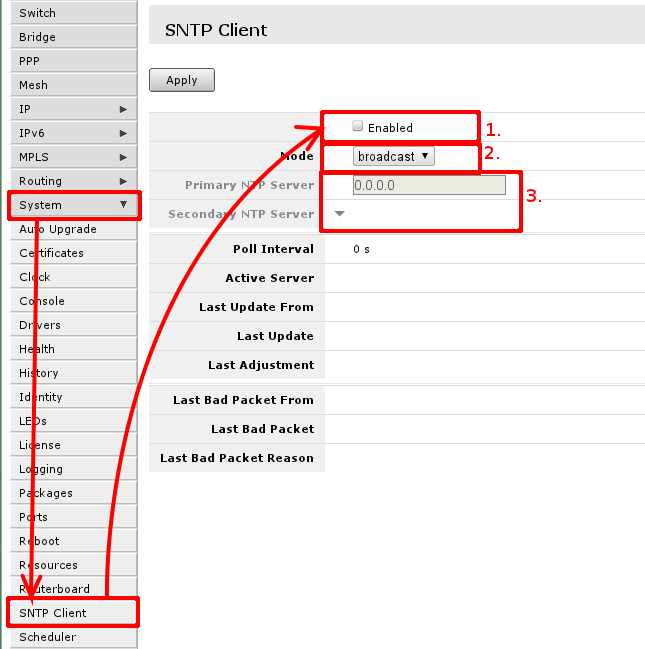 To have correct time on the router set up SNTP client if you require that. 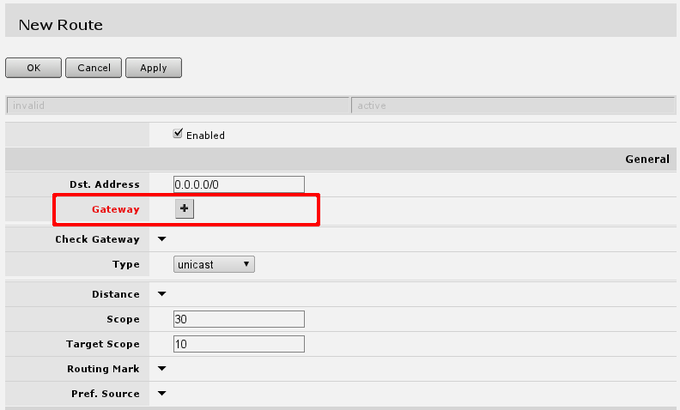 To do that, go to 'System -> SNTP' where you have to enable it, first mark, change mode from broadcast to unicast, so you can use global or ISP provided NTP servers, that will allow to enter NTP server IP addresses in third area. For ease of use bridged wireless setup will be used, so that your wired hosts will be in same ethernet broadcast domain as wireless clients. 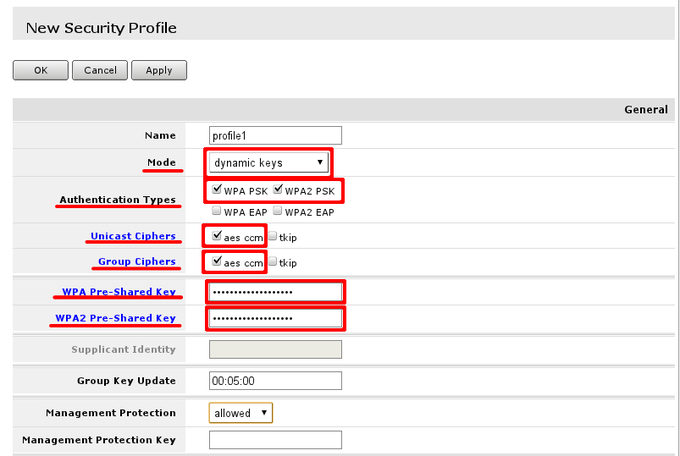 There is appropriate security profile created and selected in interface settings. To check if ethernet port is switched, in other words, if ethernet port is set as slave to another port go to 'Interface' menu and open Ethernet interface details. They can be distinguished by Type column displaying Ethernet. When interface details are opened, look up Master Port setting. 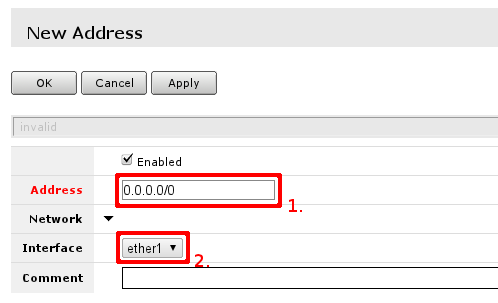 Available settings for the attribute are none, or one of Ethernet interface names. If name is set, that mean, that interface is set as slave port. Usually RouterBOARD routers will come with ether1 as intended WAN port and rest of ports will be set as slave ports of ether2 for LAN use. Check if all intended LAN Ethernet ports are set as slave ports of the rest of one of the LAN ports. For example, if ether2. 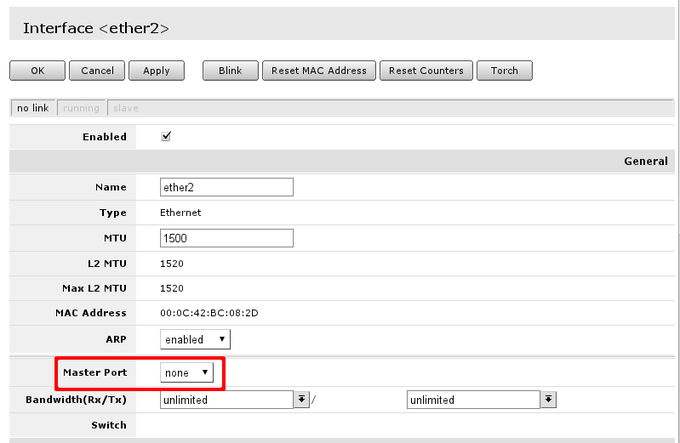 ether3, ether4 and ether5 are intended as LAN ports, set on ether3 to ether5 attribute Master Port to ether2. In case this operation fails - means that Ethernet interface is used as port in bridge, you have to remove them from bridge to enable hardware packet switching between Ethernet ports. To do this, go to Bridge -> Ports and remove slave ports (in example, ether3 to ether5) from the tab. It is important to protect your wireless network, so no malicious acts can be performed by 3rd parties using your wireless access-point. 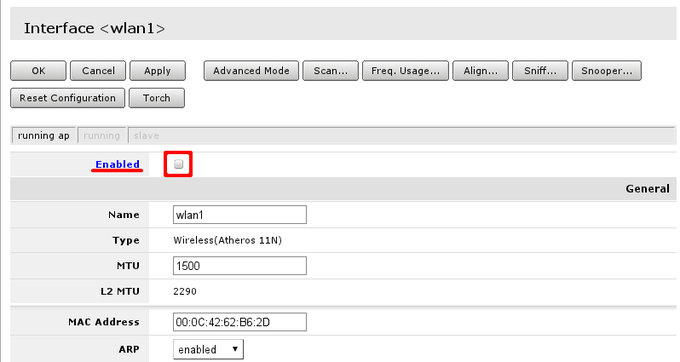 Using highlighted path in screenshot edit default profile that is already assigned to wireless interface. WPA Pre- shared key and WPA2 Pre- shared key should be entered with sufficient length. If key length is too short field label will indicate that by turning red, when sufficient length is reached it will turn blue. In General section adjust settings to settings as shown in screenshot. Consider these safe, however it is possible, that these has to be adjusted slightly. 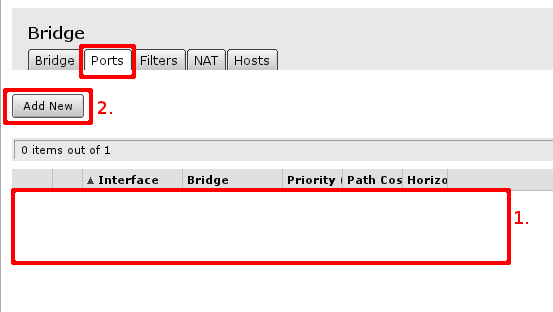 Interface mode has to be set to ap-bridge, if that is not possible (license resctrictions) set to bridge, so one client will be able to connect to device. Adjust channel width to enable faster data rates for 802.11n clients. In example channel 6 is used, as result, 20/40MHz HT Above or 20/40 MHz HT Below can be used. Choose either of them. Set SSID - the name of the access point. It will be visible when you scan for networks using your WiFi equipment. 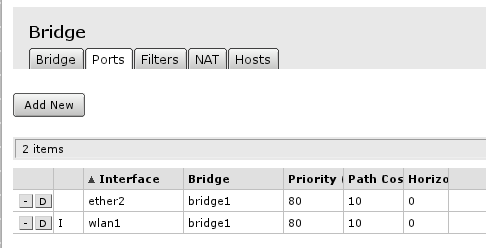 Open Bridge menu and check if there are any bridge interface available first mark. If there is not, select Add New marked with second mark and in the screen that opens just accept the default settings and create interface. 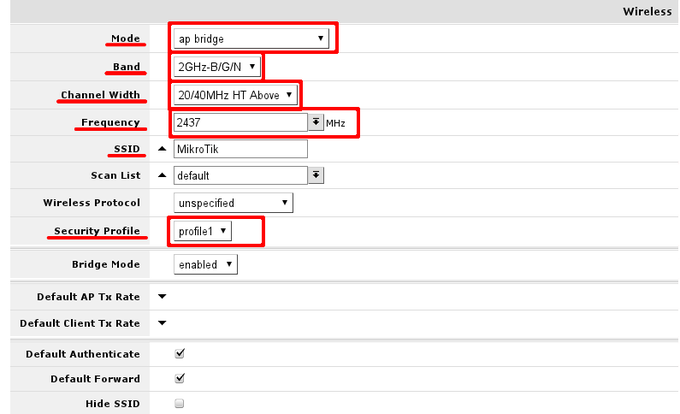 When bridge interface is availbe continue to Ports tab where master LAN interface and WiFI interface have to be added. First marked area is where interfaces that are added as ports to bridge interface are visible. 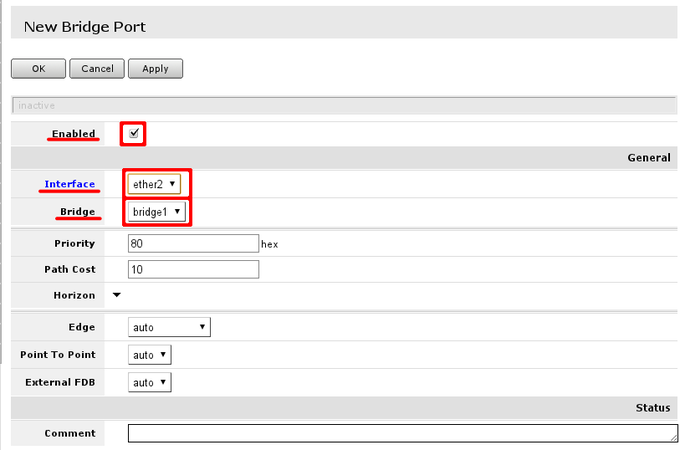 If there are no ports added, choose Add New to add new ports to created bridge interfaces. This section is here to make some deviations from configuration described in the guide itself. It can require more understanding of networking, wireless networks in general. Where all the fields has to be filled. There is other place where this can be done in case you have full privileges on the router. If you have full privileges on the router, it is possible to change password for any user without knowledge of current one. That can be done under System -> Users menu. ISP has some captive portal in place. Or contact your ISP for details and inform that you have changed device. It is located here: Tool -> Ping menu. Fill in Ping To field and press start to initiate sending of ICMP packets. Wireless unnamed features in the guide that are good to know about. Configuration adjustments. 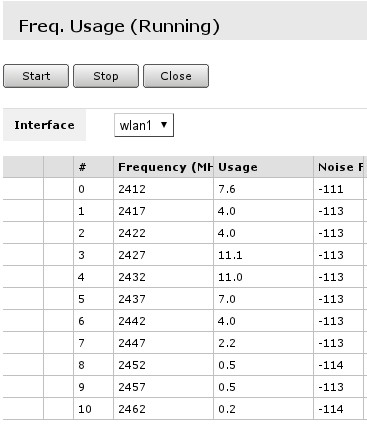 It is possible to choose different frequency, here are frequencies that can be used and channel width settings to use 40MHz HT channel (for 802.11n). For example, using channel 1 or 2412MHz frequency setting 20/40MHz HT below will not yield any results, since there are no 20MHz channels available below set frequency. Wait for some time as scan results are displayed. Do that for minute or two. Smaller numbers in Usage column means that channel is less crowded. Note: Monitoring is performed on default channels for Country selected in configuration. 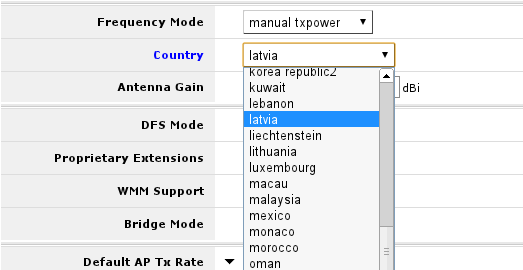 For example, if selected country would be Latvia, there would have been 13 frequencies listed as at that country have 13 channels allowed. Note: Advanced mode is toggle button that changes from Simple to Advanced mode and back. To make services on local servers/hosts available to general public it is possible to forward ports from outside to inside your NATed network, that is done from /ip firewall nat menu. For example, to make possible for remote helpdesk to connect to your desktop and guide you, make your local file cache available for you when not at location etc. A lot of users prefer to configure these rules statically, to have more control over what service is reachable from outside and what is not. This also has to be used when service you are using does not support dynamic configuration. if you require other services to be accessible you can change protocol as required, but usually services are running TCP and dst-port. If change of port is not required, eg. 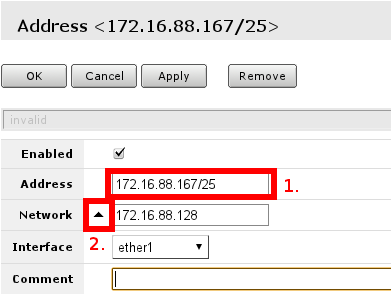 remote service is 22 and local is also 22, then to-ports can be left unset. uPnP is used to enable dynamic port forwarding configuration where service you are running can request router using uPnP to forward some ports for it. Using IP -> Web Proxy it is possible to limit access to unwanted web pages. This requires some understanding of use of WebFig interface. When required alterations are done applysettings to return to Access tab. This list will contain all the rules that are required to limit access to sites on the Internet. With this rule any host that has example.com will be unaccessible. For approach B each site that has to be allowed should be added with Action set to Allow and in the end is rule, that matches everything with Action set to Deny. This page was last edited on 27 October 2011, at 14:06.